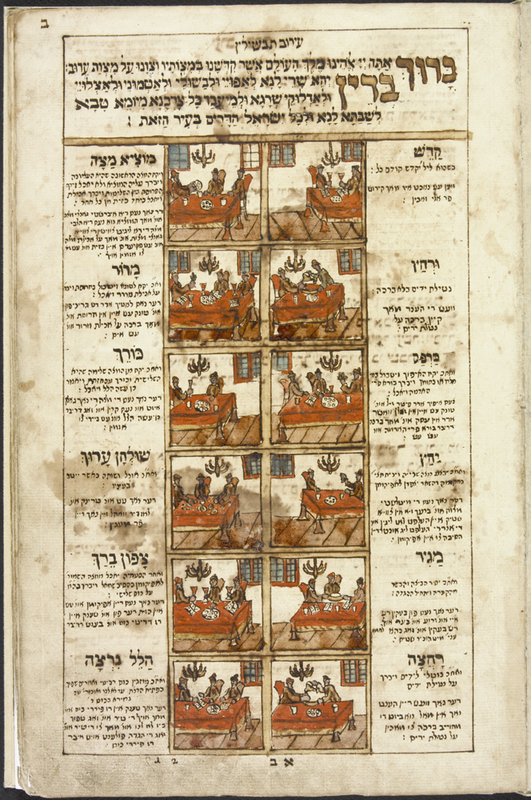 The Altona Haggadah is one of the treasures of the Jacob M. Lowy Collection. This handwritten, colourfully illuminated manuscript on paper was created in 1763 for the holiday of Passover in Altona, Germany. A haggadah, which means “telling” in Hebrew, is a text read during the Passover seder (“order” of service), a ceremonial meal that follows ritual steps laden with symbolic meaning. It is held in Jewish homes or public places, to commemorate the Israelites’ liberation from Egypt. The seder takes place on the first night of the holiday in Israel, and on the first two nights of the holiday outside Israel. The idea behind the seder and the haggadah is not a mere recounting of facts. Rather, the goal is to convey the experience of being a slave in Egypt who was liberated suddenly by God’s hand, and who as a free man witnessed God giving the Torah to Moses at Mount Sinai. The family, or any group gathered together for a seder, carries out specific ritual steps. For example, they eat foods evocative of the slave/liberation experience, such as haroset, a mixture of ground fruit or nuts (the recipe varies), to convey the slaves’ arduous work carrying bricks. Or participants eat bitter herbs such as horseradish to recall the bitterness of slavery. They drink four glasses of wine while leaning to the left, a pose of ease, showing the behaviour of free men. The four cups of wine are intended to echo the four expressions of God’s redemption of the Israelites in the biblical Book of Exodus 6:6–8 (“I will bring you out from under the burdens of the Egyptians … I will redeem you with an outstretched arm, and with great judgments”). Participants are encouraged to ask questions and debate, not just to read the haggadah passively. The seder aims to pique children’s curiosity, so traditionally the children recite a song asking why this night is different than any other night. The haggadah also includes prayers of Hallel, praising God. Fun-loving table songs, though not required, were added over time and are still enjoyed today. The challenge of transmission or making the evening meaningful is accentuated because of the variety of people living in different times and places. An olive farmer in ancient Galilee would have related to the story of the Exodus from Egypt differently than, say, a 21st-century techie in Silicon Valley. Therefore a specific haggadah is one source, among others, of popular culture for learning about a particular community. An artifact shows “mind in matter” (to quote Jules Prown), in addition to its textual content. Why is the Altona Haggadah different from other haggadot? The Altona Haggadah was part of a trend in Central Europe initiated by the “Court Jews.” These people, who often worked as financiers for noblemen, collected artistically designed Judaica objects for the home, such as handwritten and illuminated manuscripts. Such manuscripts were prized, even though Hebrew printing had existed since the 15th century! The existence of the Altona Haggadah shows that the collection of manuscripts was later adopted by the middle class. Because of the naive style of the art, an artist–scribe with less training could probably be commissioned—and at a lower cost than a “high-end” artist. The small but lively Jewish community in Altona had been granted the privilege of engaging in shipbuilding by King Christian IV. As a result, there was economic stability and a middle class. The scenes of contemporary participants on the page that shows the ritual steps of the seder indicate a certain degree of comfort. For example, they are sitting on chairs that appear to be upholstered, around a sturdy table that is covered with a red cloth. In a room lit by a chandelier, each person also has the luxury of using his own haggadah. The illustrations show the ritual steps of the seder being carried out by contemporary participants. The scenes provide a snapshot of the Jewish lifestyle in Altona in the 1760s (AMICUS 33226322). The Altona Haggadah also informs us that Jews in Altona had much in common with Jews elsewhere during the early modern period. For example, the scribe painstakingly wrote the commentary of Don Isaac Abravanel, 1437–1508, in small cursive letters, wrapped around the central text. This commentary, with its emphasis on redemption, written by a Jewish man who was forced to flee the Iberian Peninsula, was first printed in 1505 and is commonly found in Passover haggadot. The study of the Altona Haggadah, like that of any visual source, is an opportunity to learn about the artist and the iconography. The name of the artist–scribe Elkanah “Pituhe Hotem” (literally, Elkanah, “engraver of the seal,” referring to the engraved stones in the shoulder piece of the High Priest in biblical Jerusalem), son of Meir Malir (Meir, the Painter, in Yiddish) is found in the colophon, the closing statement at the end of the Altona Haggadah. We know of only two other manuscripts that Elkanah created. One of these, at the Jewish Theological Seminary in New York, is a haggadah on vellum, or animal skin, whereas the haggadah at the Jacob M. Lowy Collection is on paper. The other manuscript, “Tikune Shabat” (special prayers for the Sabbath), is found in the Klau Library of Hebrew Union College in Cincinnati. The Lowy haggadah has a unique feature: an “omer” calendar. This is a calendar used to count the 49 days from the second night of Passover until the holiday of Shavuot, which celebrates the giving of the Torah to the Israelites. An omer is a biblical unit: a measure of grain. On the second night of Passover, an omer of barley was brought to the Temple as an offering, which marked the first day of the count. Since no Jewish calendars were printed in Altona during the 1750s and 1760s, the omer calendar may have been a welcome way to keep track of the count. The Omer calendar, in which each square represents the cumulative days counted from the second day of Passover to Shavuot (AMICUS 33226322). The scribe–artist Elkanah, or the patron who commissioned the Altona Haggadah, was influenced by the Amsterdam Haggadah or its many subsequent imitations. The Amsterdam Haggadah, which was printed in 1695, featured innovative copperplate engravings. 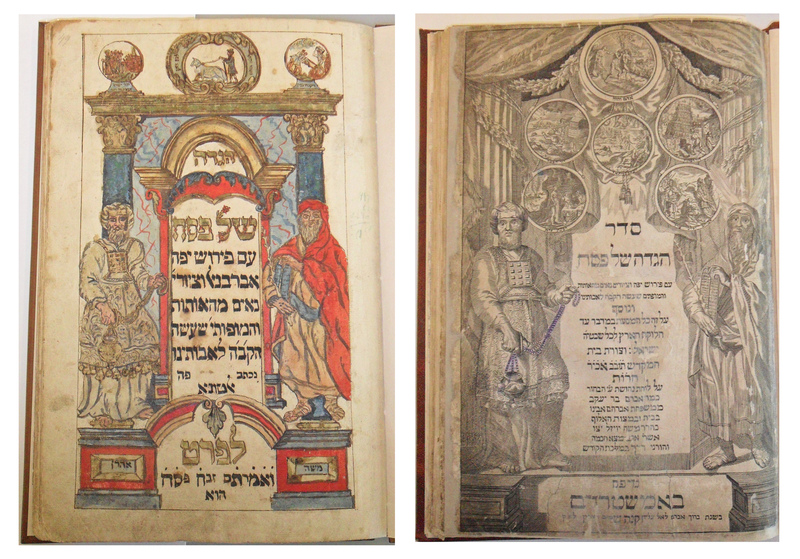 The colourful title page of the Altona Haggadah, 1763, is on the left (AMICUS 33226322); the engraved title page of the Amsterdam Haggadah, 1695, is on the right (AMICUS 29060785). Both show Moses and Aaron as well as vignettes (small illustrations) of Bible stories. 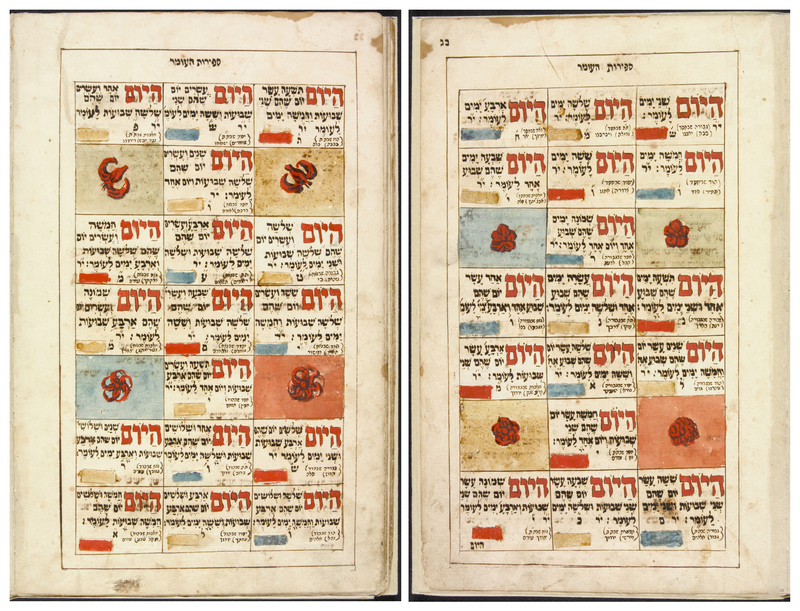 The imagery in the Altona Haggadah has been simplified, and there are fewer vignettes—only three in medallions on the top of the page. Another example of the influence of the Amsterdam Haggadah can be seen in both editions’ representations of the four sons. The four sons symbolize the attitudes of four types of participants in the seder: the wise son, the wicked son, the innocent son and the son who does not even know how to formulate a question. The colourful illustration of the four sons in the Altona Haggadah is on the left (AMICUS 33226322); the engraved version of the four sons in the Amsterdam Haggadah is on the right (AMICUS 29060785). Elkanah, the artist–scribe, used iron gall ink, notorious now for its corroding effect on paper, to write the text. He illuminated it with colours whose pigments included copper and other metals. Both ink and pigments caused corrosion that even a de-acidification in 1987 could not stop. The Altona Haggadah was brought to Library and Archives Canada’s conservators in 2007. How would they save this cultural artifact? They will share their secrets in the following blog, to be published next week. Leah Cohen is a curator at the Jacob M. Lowy Collection, Library and Archives Canada. This entry was posted in Our Collection and Facilities and tagged Altona Hagadah, Altona Haggadah, Amsterdam Hagadah, Amsterdam Haggadah, Jacob M. Lowy Collection, Omer Calendar, Passover Hagadah, Passover Haggadah by Library and Archives Canada Blog. Bookmark the permalink.